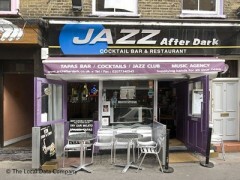 About: Jazz After Dark is a late night jazz venue with live music every night. A wide variety of cocktails are on offer. Food is also available; choose from A La Carte or set menu. Ideal for fun nights out, birthday parties or hen nights. They can cater for private parties of up to 50 people and provide outside seating on the pavement. The Mediterranean tapas aren’t the best here, but most people don’t go for the food. Cramped and bustling, this late night venue has bags of atmosphere; Amy Winehouse once turned up with a group of friends and did an impromptu set. I play in a soul-blues band and in several occasions we have offered to play for free at Jazz After Dark. We have always filled the place up with family and friends. We have always been asked to pay even for the band's drinks. We have received several complaints from our friends for having being treated aggresively by the staff. On the last gig, a friend that had travelled for 1 hour to see us, was refused addmission for no reason at all. Another friend was harassed because she left her bag on a chair, while visiting the restroom. Friends have reported being pushed to buy drinks straight after entering the place. CHEAP, CHEAP, DISGRACEFULL, NEVER AGAIN!! I was not surprised to see that this Venue has mixed reviews, but we love it mainly for the music. Live jazz and blues is why we come here, and it has a very cosy intimate feel to it, sort of like a sixties folk club. There is not much room, but that only adds to the cosy feel. perhaps it might be good to rent out the place for a party of say twenty people for a birthday or some other similar occasion. The food is vaguely Greek and somewhat snacky. We like that when we go out to this place, because we go mainly for the music and the food is secondary, so we think appropriate to the venue. this is the WORST place i have ever been to - the food was awful (straight from then freezer), table space non-existant and staff rude; our food came frozen, we asked for waiter to take it back and then they said all we did was complain! theres an entry fee (for the live jazz) but this applies even if you (are stupid enough) have a table booking. go somewhere else, anywhere but here -- WORST venue ever and i've been to some! Jazz After Dark was absolutely the most horrible place I'd ever been to. They showed our party of eight into what can only be called a BOX. When someone had to leave the table, 3 other people had to stand up and shift furniture around so there was space to move. The very cheap decor seemed untouched from the 70s - not in a trendy way unfortunately. The food was probably boiled in a bag before serving and it TASTED like it. The band was not too bad, but then not so good either - and after they played, came round and shoved a hat under our noses to beg for change. The management was openly rude/hostile. We were in laughing hysterics the whole night to have landed ourselves in such a hellhole. Quirky and charming little restaurant. Food is not fantastic, but late-night live music was an absolute treat. New Orleans funk/jazz and soul band, Platform 4, were playing when we visited for our Christmas party. I think they will be back on 17th December. Check them out! Great vibes... You should book them for your own parties if you can't make this date. Lovely night out. Well, we were looking for somewhere a bit different. The criteria - great music, no hassle, late drinking (always good! ), relaxed atmosphere (ie: chance of a seat!). So I think we found it. ...Jazz After Dark on Greek Street is certainly a little quirky. Part kitsch bar, part cafe, part live music . We have been on different nights of the week. Each night is quite different. And the *best* night by far for us is Thursday nights. This is live Blues night and features a fantastic blues band who mix up blues with funky jazzy numbers. Very relaxed and fun as well as superb playing.